Republicans make fun of Marco Rubio's fancy heeled boots. 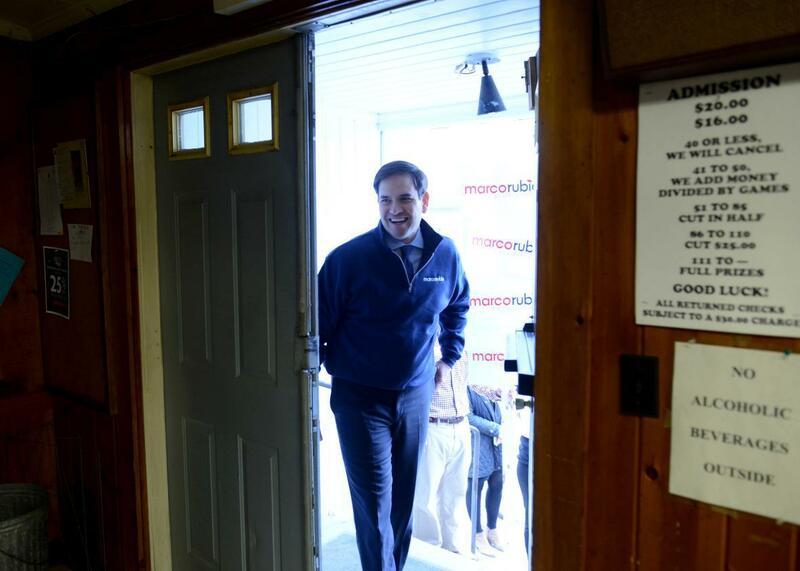 Republican presidential candidate Marco Rubio enters a town hall at the VFW Nov. 30, 2015, in Laconia, New Hampshire. … and Sen. Marco Rubio’s girly little girl boots. The Republican side this week is consumed with chatter about Marco Rubio’s choice of footwear during a recent visit to New Hampshire. The problem, in short, is that Rubio’s may well be fancy, made of the choicest leathers and featuring a disconcerting rise in the heel region. To the naked eye, they look suspiciously Eye-talian. In this country, the common, conservative man is expected to wear a bunch of greasy McDonald’s wrappers on his feet, tied together by the intestines of a freshly murdered grizzly bear. The New York Times’ Michael Barbaro first noted that Rubio was wearing nice shoes in New Hampshire. From there, Vanity Fair speculated about the model and price of this “stunning pair” of shoes. Giorgio Brutini (a modest $85)? Maison Margiela (on sale for $597)? Tom Ford ($1,990)? Rubio’s campaign told Politico that the boots are Florsheim, going for roughly $100. Florsheim makes fine shoes that can be purchased at stores such as Macy’s—nowhere in the same ballpark as, say, Sen. John McCain’s Ferragamo loafers. The heel offers two valuable openings for Rubio’s rivals. First, it suggests that Marco Rubio dresses like a woman, which is unacceptable to the conservative electorate. That Rubio is availing himself of heeled footwear also reminds the public that Rubio is not an especially tall man, roughly 5-foot-9. A politician’s shortness implies not just physical weakness but a devastating moral deficiency as well. Jeb Bush is the hale, hearty product of aristocratic American breeding. He has no need for heeled boots. And here we have Sen. Ted Cruz’s rapid response director, Brian Phillips, demonstrating why he makes the big bucks by playing up the European aura of Rubio’s boots, while making a war pun. Carly Fiorina is suggesting that her high heels are better than Rubio’s high heels because they are higher heels. So, this is all dumb. Which ensures that it will probably work in a primary campaign dominated by Alpha-male guttural signaling. Expect Rubio to be wearing the McDonald’s wrappers from now on.